There is a whole bunch of other stuff that I want to take care of before baby gets here that are not necessarily things for a baby, but seem more important to me now that we are having one. These are being lumped into the "non-baby baby item" category. First among these is new dressers for our room. 3. Husband's clothes are all in the nursery right now and since we will need that closet for BABY stuff, he has to move back into the Master Bedroom with me. Rather than get rid of my stuff, let's just make more room. Don't you like our problem solving skills? In order to not break the bank (since there is a BABY coming to live with us soon, and I am still undecided about working and/or staying at home, we are rolling with larger versions of the same dresser we are moving into baby's room. Hopefully we will be picking them up this weekend. Huzzah! We are undecided about the finish...it will be one of these two finishes and BOTH of these dressers though. I love the light finish for the feel of our room, but hubs thinks it is too trendy. Meh. They are tres reasonably priced, and also solid wood. Check and check. Thanks to Navy moves in the future we try not to spend too much money on "investment pieces" because who knows what will happen to them. That being said, sometimes I still do. Spend the money that is. Gah, this is badly worded. Let's move on. We have had a craptastic vacuum cleaner for a while now that, thanks the A's ingenuity, is held together with packing tape. It was $40 and was fine for my little apartment in Georgia, but for an almost 1800 sq foot house? Puh-lease. I mean, we keep things relatively clean, but clean enough for a baby to be crawling around on? No thanks. Hardwood floors and dog hair = nasty visions of me racing toward a baby putting fist of dog hair tumbleweed in mouth. GAG. Since my daddy works at Sears, he managed to snag this for us at one helluva good price (on sale, plus friends and family night, plus employee discount). I pick it up on Wednesday and I could NOT be more excited to see this baby in action after tons of reviews from friends and family alike. Moment of realization: I am excited about a vacuum. My life has gone down hill. That is all. ...and I managed to refrain from making any jokes about our vacuum sucking in this whole post. Until now. I couldn't resist. 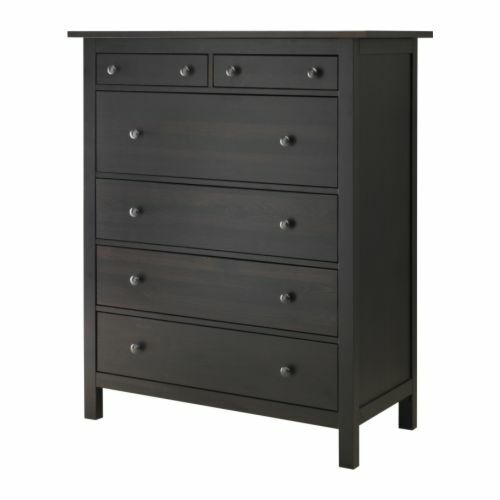 i have two hemnes dressers! !love them! will tell ya, with the darker you can see more scratches and scuffs since the wood underneath is light. i also have a dyson animal. if i was in love with an appliance it would be that one. make sure you get it professionally maintained every 2-3 years and it will be your best friend. We have the tall hemnes dresser in black & love it---just a warning it does make me dust more :) We used the 3 drawer hemnes for Ava & Cole's dresser/changing table and it was perfect. I <3 IKEA. That's all I'm going to say.